River Runner: London Marathon - Follow Me! 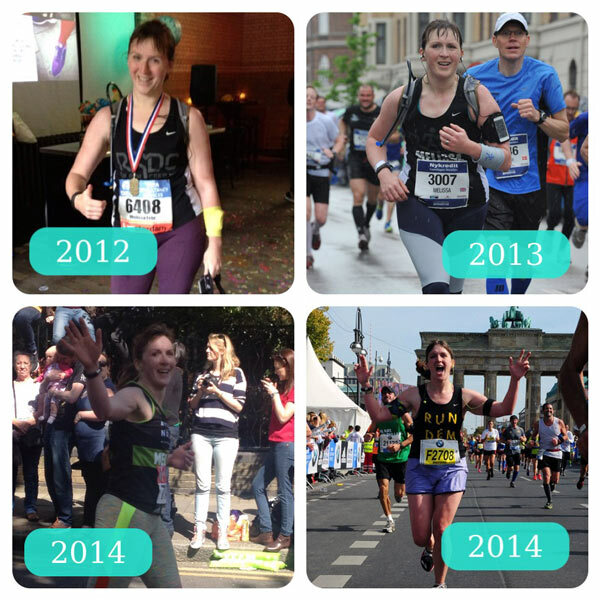 London Marathon - Follow Me! 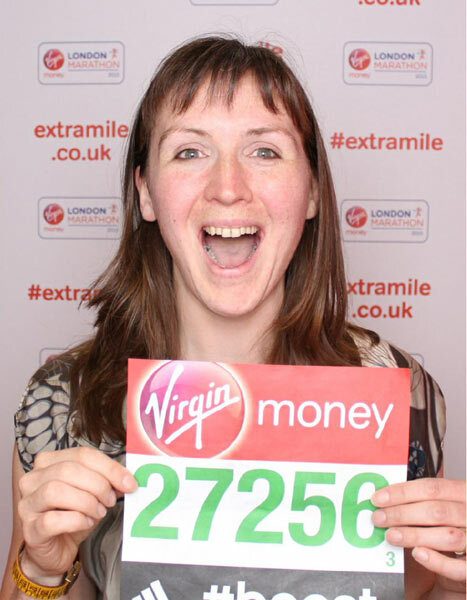 Tomorrow I will run the London Marathon. As I wrote about last week, I’m surprisingly chill about the whole thing as I haven’t really felt like I’ve been “marathon training”. This is my fifth marathon and my second time running London, and it’s not even my “A-race” for the year, either. So why exactly am I running this? Well, I fought long and hard to earn myself a Good For Age (GFA) place last year, and by god I was going to use it! It basically means that I’m free from the stress of fundraising for a charity, and all that entails. I also really want to see if I ran repeat my pacing success from Berlin marathon last Fall and run a steady, controlled, and even first 22 miles, and crank it up in the last 3mi (5km) to finish super strong. I also really didn’t enjoy the crowds at London marathon last year, and well, as cross country showed, I’ll try anything twice. I really am hoping to enjoy it more this year, especially Run dem Crew’s legendary Mile 21 cheer station, which was a bit of a blur of heat, noise, and confetti last year! 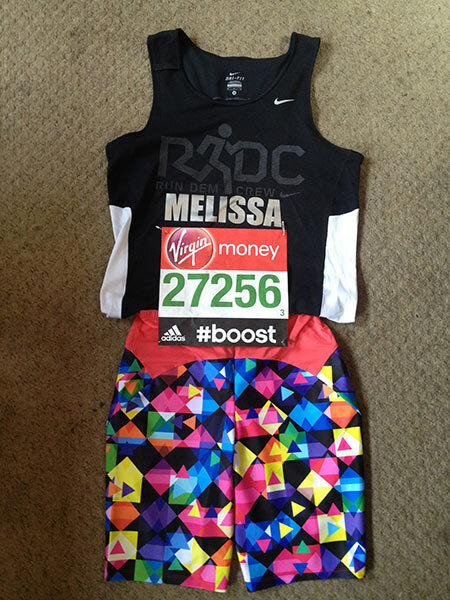 This isn’t my traditional, full kit layout photo, but as loads of people were asking what to look out for on the course, I wanted to show the my old-school RDC vest (which I wore to run my first two marathons, see above! 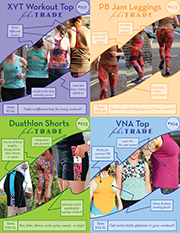 ), and a special version of my latest Steeplechase Leggings pattern, which has no inseams! The RDC logo is highly reflective, but a bit difficult to spot from a distance, so look for the shorts instead! Since I’ve got to carry 4 gels, a pack of Shot Bloks, and a kinder egg capsule full of Saltstick caps this year, the single back pocket in these isn’t really enough, so I’ve also made a matching armband pocket to store the rest (a strategy which worked well in Berlin!). The salt capsules are a relatively new addition, but I’ve always been a super salty sweater (I’ve been known to have a salt crust on my face after hot 10km races), and I’ve found that one capsule every hour or so during hard sessions really helps me. Like, within 30 seconds of taking it, I feel significantly better. Having tested them under race conditions at Cambridge Half and then again on a 20 miler, I’m feeling confident about using these tomorrow, too. 1. The official London Marathon site (my race number is 27256), which will show my position at every 5km and guesstimates in between. Note that the tracking portion of the site will only appear on race day – Sunday 26 April (the mass start is at 10:10am BST), and that my little dot will only move once I’ve passed the 5km timing mat (approx 10:35am). This year there’s also (finally!) an official iOS app, which means you can plug in all your favourite runners ahead of time and get updates when you latch onto a tube station or pub’s wifi (3G along the route is notoriously oversubscribed on race day). I had a look on Google Play, but there doesn’t seem to be an Android version, sorry. These two official methods take data every 5km when I step over a timing mat, and extrapolate my pace in between. So if a runner changes pace significantly, it’s not going to reflect that. 2. Twitter – My Runmeter app will tweet from my account that I’ve started the run, and you can click on the link to see where I am, and/or reply to ANY of my tweets (including that one) to have it spoken into my ear while I run. The only issue here is that if the 3G is unavailable when I start (and it’s likely it’ll be oversubscribed at the start and finish), the tweet with the link in it won’t go out. You can still reply to any of my tweets though, to have it spoken to me (you can’t just write a new mention to me, though – it has to be a reply). Also, do not freak out if my progress suddenly stops near the end of the race, as it did along the Embankment last year! That just means the battery on my phone died prematurely (well, it is supplying me with tunes, GPS, and spoken comments along the way! ), and I’ll update it when I’m reunited with my spare battery after the finish. 3. DailyMile – join dailymile.com and send me a friend request before tonight, and you can access the same tracking link, and also any comments added to my post while I’m running will also be spoken into my headphones. The advantage here is that Runmeter will poll Daily Mile something like every 5min throughout the race, so if the 3G is down at the start, it’ll just post it at the next opportunity, then updated as it gets info from my phone. My profile is here After you sign up, hit the “Add Friend” button on the left under my photo. Note that other than for races, I really don’t use DailyMile much anymore, much preferring Strava since they actually update the site and add new features more than once every 5 years. But Strava doesn’t support the spoken comments yet! So wish me luck, and keep an eye on the above tomorrow! I wish strava had the comments, and also more options than just running or cycling. Other than that I love it! Have an amazing race tomorrow I will be watching and will be looking out for you and cheer you on. Run like the wind! (Or perhaps you already have?) love you!